Saiansh Reality is one of the most trusted and an ISO 9001:2008 Certified real estate firm located in Jaipur and Delhi. We are working since 2010; our approach to the housing market is comprehensive while still being focused on our client’s specific needs. We analyze properties run by both large real estate companies and smaller agencies representing individual owners. Therefore, we acquire in-depth housing information which enable us to provide our clients with useful services and opportunities in the market. We believe in the utmost satisfaction of our clients. We provide best assistance to our clients. We have experienced and result oriented team, having vast knowledge in this domain. We ensure to complete all the related legal formalities and registrations for the properties of the clients. To maintain long term relations with the clients and gain their trust, we deal with them in a crystal clear manner. We have emerged as one of the leading real estate firm in Jaipur in a very short span of time. The whole credit of our success is enshrined to the enthusiastic and young team of professionals in our firm. Our professionals have maintained a detailed database of all the existing properties in and across Jaipur, so as to provide various options to the clients to choose from. We work wholeheartedly as a team with sincere efforts to fulfill the dynamic needs of the clients in the least time possible. We follow ethical business policy so as to maintain trustworthiness among the clients and goodwill in the market. We are a client centric firm, and offer the best real estate services to the clients. We offer our prompt services to the clients at very cost effective prices. Mansarovar is the biggest colony in whole of Asia. It is situated in the south of Jaipur. There are many good educational institutes in Mansarovar. Many good and big schools. Nowadays the highest rates of properties are in Mansarovar also there are good colonies of JDA. Biggest groups are building their projects in Mansarovar. Metro hub is there, Mansarovar is well connected to whole of Jaipur. Sanganer is more ancient then Jaipur. It is a tehsil. There is a big Jain temple situated in Sanganer. Sanganer is very famous for it's bedsheet work. There is a temple of Rana Sanga temple in Sanganer. There are cottage industries of Handmade paper in Sanganer. Also work of Blue Pottery is there. Sanganer is well connected to Jaipur and it is the market majorly for the villagers. It is the good place to live as there is good too and fro of buses; also having a railway station. Ajmer road is the most developing area of Jaipur. All big groups are working on Ajmer Road. To invest on Ajmer Road will be beneficial in future. 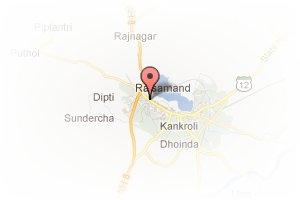 Address: Ajmer Road, Mansarovar, Jaipur, Rajasthan, India. 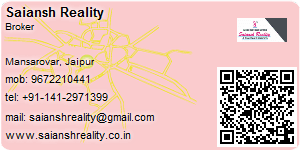 This Broker Profile page for "Saiansh Reality" has been created by PropertyWala.com. "Saiansh Reality" is not endorsed by or affiliated with PropertyWala.com. For questions regarding Broker Profiles on PropertyWala.com please contact us.